I always thought jam making had to be a summertime pursuit. Utilizing fruit at its peak beginning with the strawberry harvest in late June then on to raspberries, peaches and pears as we move into fall, to mention a few. But jam should really be made in the winter on a cold, dark day when the weather is twenty degrees at noon and all I want to do is stay inside, wearing my slippers and sipping a cup of hot tea. I actually feel like firing up the canning pot since I have all the time in the world to stir preserves at the toasty warm stove. Forget watching football, jam is the thing to make on a lazy Sunday afternoon. If fresh fruit at its peak is required for this project, then citrus is the thing in January. Marmalade to be exact, is the type of jam to put up. The problem is, I have never cozied up to the taste of it. Looking at a jar of sticky orange jell, skinny strips of dark orange zest suspended throughout, it always looked sweet and inviting. That is, until I tasted it. I expected the sweet, fruity flavor I encounter in my favorite jam flavors, that sugary sour bite like from citrus candy. But the shocking surprise of the bitter pith taste threw me off. Growing up, we never had a jar of marmalade hanging out in the back of our refrigerator. Val says it's because us kids didn't like it and she used all of her jam and jelly budget on Smucker's strawberry or raspberry for our lunch box PB& J's. We were never forced to acquire a taste for those sophisticated preserves. I'm sure she would have liked to treat herself to a fancy gourmet jar of imported orange marmalade but couldn't justify the expense. Fyi, she usually has a jar tucked away for herself now that she doesn't have to pander to our needs, anymore. For some reason, I wrongly assumed that children today and those of my generation (under the age of fifty years old), share my opinion regarding marmalade. But a quickly posted question on facebook revealed an informal and completely unscientific survey that said otherwise. When asked, "Is marmalade just for grandmothers and Brits?" the results returned a 50/50 of pros and cons, from all different age groups. For those against, my guess is that the bitter pith is to blame. 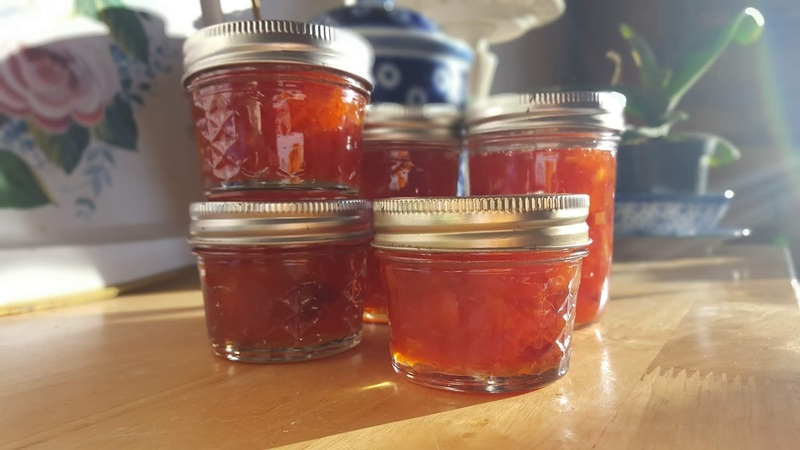 So, I set out to create a version of marmalade to please my sweet tooth. 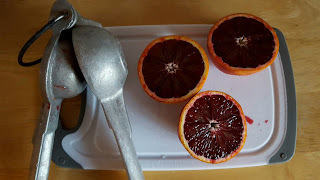 Blood oranges for the intense color and Cara Cara for their sweetness. I only used a small amount of zest. And as for the pith, that all ended up in the compost bucket after I cut it away from each piece of fruit leaving just the juice and the edible sections. I needed to add some pectin on the second day of the process, having removed the part of the fruit with it. But other than that, I did not have to mess with the fruit all that much. I think what I created can please both parties: those that like marmalade in its traditional form and those of us who prefer a sweeter note on their morning toast. Thoroughly wash all the oranges. Peel the zest from the pith of one blood orange. Finely dice and place in a large stock pot. Cut away the peel and pith from all the oranges. Roughly chop all the oranges, remove any seeds and add all the chopped oranges and juices to the pot. Discard remaining peel and all pith. Cover oranges with apple juice. If the oranges are not completely covered in liquid, add just enough water to cover them. Bring the mixture to a boil and cook uncovered until the mixture reduces by one third. This takes about 30 to 40 minutes. Gradually add the sugar, stirring constantly until it dissolves. Add the lemon juice and taste. If needed, add more sugar or more lemon juice. Boil for 5 more minutes. Remove from heat and allow mixture to rest overnight. Place a few small plates in your freezer for the plate test. If you are planning to can the marmalade, set up your canning pot with boiling water enough to cover the jars by at least one to two inches. Sterilize jars, lids and rings. Bring the orange mixture to a boil over high heat, stirring often. If the mixture appears to be thickened, test it by placing a few teaspoons on a chilled plate and hold it vertically to the ground for a second. If the preserves are finished, they will not run much and will set up semi-firmly if placed back in the freezer for a few minutes. If it remains runny, it is not finished and may need some added pectin. To be sure, bring the mixture to 215 degrees on a candy thermometer. If it is still not thickened at that point, add pectin a tablespoon at a time, bring back to boil and do the plate test again. The mixture should resemble a very thick syrup while it is still hot. Once the jam is set, remove from heat and allow it to rest for about 2 minutes. Ladle jam into warm jars leaving 1/4 inch head space. Wipe the rims of the jars with a clean, damp cloth. Place a sterilized lid on top and screw into place with a ring. Place jars in water bath in canning pot with at least 1-2 inches of water covering the top of the jars. Bring water to a boil, decrease heat to a simmer and process for 10 minutes. Turn off the heat and leave the jars in the water for about 2 minutes more. Using a jar lifter or tongs along with a pot holder, transfer the jars onto a smooth surface to cool undisturbed for 8 hours. Check to be sure the jars have sealed. If any did not, refrigerate and use within a few weeks. The properly sealed jars can be stored in a cool, dry place for up to 2 years.